Despite the efficiency and low dissipation of the stream-collide scheme of the discrete-velocity Boltzmann equation, which is nowadays implemented in many lattice Boltzmann solvers, a major drawback exists over alternative discretization schemes, i.e. finite-volume or finite-difference, that is the limitation to Cartesian uniform grids. In this paper, an algorithm is presented that combines the positive features of each scheme in a hybrid lattice Boltzmann method. 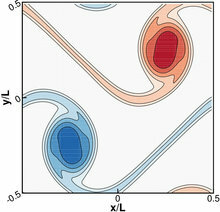 In particular, the node-based streaming of the distribution functions is coupled with a second-order finite-volume discretization of the advection term of the Boltzmann equation under the Bhatnagar–Gross–Krook approximation. The algorithm is established on a multi-domain configuration, with the individual schemes being solved on separate sub-domains and connected by an overlapping interface of at least 2 grid cells. A critical parameter in the coupling is the CFL number equal to unity, which is imposed by the stream-collide algorithm. Nevertheless, a semi-implicit treatment of the collision term in the finite-volume formulation allows us to obtain a stable solution for this condition. The algorithm is validated in the scope of three different test cases on a 2D periodic mesh. It is shown that the accuracy of the combined discretization schemes agrees with the order of each separate scheme involved. The overall numerical error of the hybrid algorithm in the macroscopic quantities is contained between the error of the two individual algorithms. Finally, we demonstrate how such a coupling can be used to adapt to anisotropic flows with some gradual mesh refinement in the FV domain.